Brazi’s LCC Azul is set to become the first low-cost carrier in the Americas to establish a long-haul operation. Azul was founded by David Neeleman, who also founded highly successful New York-based JetBlue. The hereto-domestic LCC has made commitments for six second-hand A330-200s and five new A350-900s. The A330s will be delivered from early 2015 and be used to launch services to the US; the A350s will be delivered from early 2017. Widebodies and long-haul services represent a gigantic leap for Azul as the carrier now only operates Embraer regional jets and ATR turboprops. Azul has quickly expanded since launching in late 2008 and has already surpassed 100 aircraft and 100 destinations while capturing a 17% share of the world's fourth largest domestic market. But it has never operated scheduled international services. The sudden move to long-haul services will shake up the Brazilian market, prompting a potential move from leading Brazilian LCC Gol, which operates an all-737 fleet including an unusual one-stop product to the US. Azul unveiled plans on 23-Apr-2014 to begin a long-haul operation in early 2015 with flights to the US from its main hub, the Sao Paulo alternative airport Campinas. It also announced plans to lease six Rolls Royce-powered A330-200s for delivery from early 2015 and five Rolls Royce-powered A350-900s for delivery from early 2017. Azul and ILFC have concluded agreements covering three A330-200s and all five of the A350-900s. 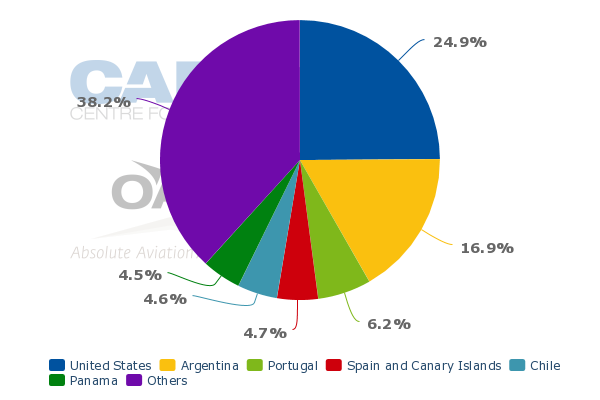 Azul currently operates a fleet of 137 aircraft consisting of ATR 42/ATR 72 turboprops and E190/E195 regional jets, according to the CAPA Fleet Database. Growth of the fleet was accelerated in 2012 following the acquisition of TRIP, which also operated ATR turboprops and E-jets. The integration process with TRIP, which followed a regional hybrid model, is now in the final phases and should be complete within the next couple of months. Notes: Firm orders include those placed directly by the operator and by lessors assigned to the operator. Azul is the only LCC in the Americas currently operating turboprops and is one of only three LCCs in the Americas operating regional jets. The others are Mexico’s Interjet and New York-based JetBlue, which was founded by Azul CEO and founder David Neeleman and leased Azul its first two aircraft. Azul now will also gain the distinction of being the first LCC in the Americas to operate widebody aircraft. But, paradoxically, it will remain the only LCC in the Americas not to operate Airbus or Boeing narrowbody aircraft. There are currently six LCCs with widebody operations, including four in Asia-Pacific where the long-haul low-cost model was pioneered. Australia’s Jetstar International and Malaysia’s AirAsia X became the first of the current generation of long-haul low-cost carriers in 2006 and 2007 respectively. Azul plans to configure its A330-200s with 245 seats. The aircraft, which are currently operated by Emirates, will reportedly be reconfigured with 35 lie-flat business class seats, 50 extra-legroom economy seats and 160 normal economy seats. Azul already offers an extra-legroom economy seat product at the front of its E190/E195. In-flight entertainment monitors will be included at every seat, following the typical Azul and JetBlue model (both carriers offer LiveTV). Azul and JetBlue have always followed hybrid models, offering complimentary snacks, drinks, checked luggage and IFE. Of the long-haul LCCs, flynas and to a lesser extent AirAsia X and Jetstar follow hybrid models while Cebu Pacific, Scoot and Norwegian are "purer" LCCs. Azul will have the lowest seating density of all the widebody LCC operators. The six existing long-haul LCCs currently configure their widebody aircraft with between 291 and 436 seats. The 291 seat count is on the relatively spacious 787-8 operated by Norwegian. Jetstar and flynas are the only carriers in the long-haul LCC grouping operating A330-200s (excluding AirAsia X which has just one A330-200 that is due to be returned in 2015). Jetstar’s A330-200s, which are now in the process of being replaced with 787-8s, has 302 seats and flynas’ A330-200s, which are being leased from Hi-Fly, has 335 seats. Several full-service carriers have A330-200s with more than 250 seats. Note: AirAsia X’s one A330-200 and two A340-300 are excluded. Azul will also be only the second LCC with a lie-flat product, joining AirAsia X. flynas offers an angled lie-flat seat in its business cabin while Jetstar, Norwegian and Scoot have recliner style business class seats (which are similar to premium economy on some full service airlines). Cebu Pacific is the only carrier in the group that has opted for an all-economy configuration, with no premium seating. Azul plans to offer the same three products (economy, economy with extra legroom and business) in the A350, which reportedly will be configured with 323 seats. Mr Neeleman stated that Azul has no intention of adding A320 family aircraft, meaning the carrier will not operate any aircraft with more than 120 seats or less than 240 seats. The most common aircraft for LCCs are in the 150-seat to 200-seat range. Leapfrogging the most common size aircraft for LCCs could make it difficult for Azul to expand into the regional international market or domestic trunk routes. But Azul has built up a successful niche by focussing on thin Brazilian domestic routes, a majority of which are not operated by any other carrier. TAM and Gol do not operate aircraft smaller than the A319 and 737-700 respectively. Brazil’s vast size and the rapid growth of secondary cities have opened up opportunities on point to point routes bypassing major cities. Campinas also has grown rapidly as Sao Paulo’s two main airports, Congonhas and Guarulhos, have become congested. Congonhas, located near the centre for Sao Paulo, only handles domestic flights and is slot restricted. As a start-up Azul does not have any weekday slots at Congonhas but is able to operate a limited number of flights on weekends. Guarulhos is the major international gateway to Brazil and is also the largest domestic airport in Brazil. Campinas is currently the seventh largest domestic airport in Brazil based on current seat capacity. 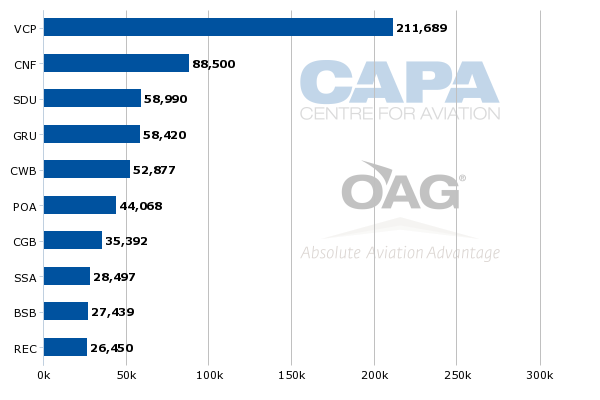 Azul currently accounts for 89% of total seat capacity at Campinas, according to CAPA and OAG data. Campinas (VCP) is by far Azul’s largest hub, accounting for 42% of its total seat capacity. Its second largest operation is at Belo Horizonte (CNF). Campinas has primarily been used for domestic services and cargo but has started to attract some international services, including from TAP Portugal and Pluna before the Uruguayan carrier ceased operations in 2012. Gol also recently announced plans to launch from 18-Jul-2014 three weekly flights from Campinas to Santo Domingo with continuing service to Miami. This will be Gol’s first international service at Campinas and will be only the second scheduled international passenger service at the airport after TAP’s twice weekly service from Lisbon. Campinas is the most logical hub for Azul’s new long-haul operation as the carrier will be able to tap into the largest source market in Brazil, the Sao Paulo metropolitan area, and offer connections. Azul currently operates about 50 domestic routes from Campinas, giving the carrier a huge base of potential feed for its new US routes. Brazil’s largest carrier, TAM, currently only operates two domestic routes from Campinas. Gol operates four domestic routes and is about to launch a fifth, a high frequency service on Azul’s biggest route Campinas-Rio de Janneiro Santos Dumont (SDU), which along with the new Campinas-Santo Domingo-Miami service is an indication of a brewing battle between Brazil’s two LCCs. Although much smaller than Gol, Azul has the largest domestic network among Brazilian carriers, which could give the carrier an advantage as it enters the Brazil-US market. The US is by far the largest international destination from Brazil, accounting for 25% of the country’s international seat capacity. Such a large pie persuaded Azul to skip over the regional international market and focus on the biggest market. Azul could still potentially enter some regional international markets using its E190/E195 fleet. Argentina and Uruguay would both be easily within range of the E190/E190s, giving Azul an option without needing to add A320s or 737s. Argentina accounts for 17% of total Brazilian international seat capacity and about half of all intra-South America international capacity while Uruguay accounts for about another 3%. The US-Brazil market also presents Azul with an attractive opportunity as it will be only the second Brazilian airline (after TAM) with non-stop services to the US. In regional international markets Azul would be the third Brazilian carrier after Gol and TAM. Gol has been increasing its focus on the international market over the last two years as domestic market conditions have become challenging. In the first two months of 2014, Gol’s international RPKs were up 19% while TAM’s RPKs were down 5% year over year. Gol is still a much smaller international carrier, with a 15% share among Brazilian carriers compared to 85% for TAM, but is eager to close the gap. Gol’s international expansion included the late 2012 launch of services to Miami and Orlando. But both destinations are served with a one-stop product via a mini-hub in Santo Domingo as Gol has been adamant to keep its single-fleet strategy. Miami and Orlando are served from Santo Domingo, where passengers arrive from Sao Paulo Guarulhos, Rio de Janeiro Galeao and, soon, Campinas. But Gol has payload restrictions on the Brazil-Santo Domingo legs, making the operation relatively inefficient while the inconvenience of the stopover has made it challenging to sell. Azul’s entrance will make it even more challenging for Gol as Azul comes in with a competing low fare product plus the convenience of non-stops. Gol has had some success stimulating demand in the Brazil-US market, perhaps convincing Azul of the potential. But once there is a non-stop low-cost option, Gol’s niche could be compromised. Gol could eventually be faced with the difficult decision of withdrawing from the US or adjusting its strategy once again by acquiring widebody aircraft. Even if Gol retreats, Azul will have its share of competition. While the US is a popular destination for Brazilians, total non-stop capacity between the two countries has increased by about 40% over the last two years. US carriers in particular have expanded rapidly, taking advantage of traffic rights made available from a new liberal bilateral agreement. The three main US airline groups (American/US Airways, Delta and United) now account for 71% of total seat capacity in the Brazil-US market. 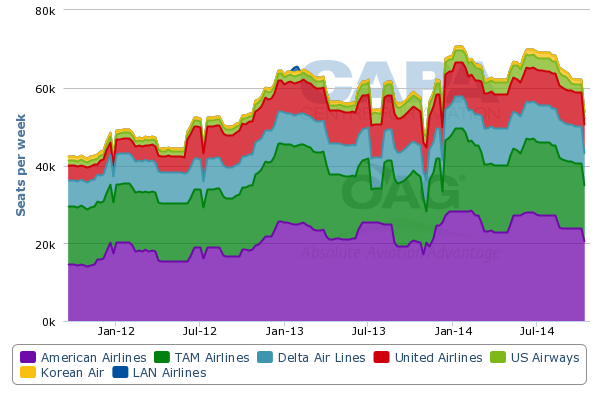 LATAM subsidiary TAM, a close partner with American and now a member of oneworld, accounts for about 28%, according to CAPA and OAG data. Azul could potentially partner with United, which has only a 14% share of seat capacity in the Brazil-US market compared to 37% for American and a powerful 69% share for the American/TAM combination (includes flights operated by US Airways). Azul recently began interlining with United and the two carriers also now have a reciprocal frequent flier arrangement. Azul’s initial US routes would not overlap with United as Azul is looking at Florida – most likely Fort Lauderdale near Miami and Orlando – while United serves Brazil from its hubs in Chicago, Houston, Newark and Washington Dulles. A stronger partnership between Azul and United could give United access to the largest Brazil-US market. Sao Paulo-Miami is now the largest Brazil-US route while Sao Paulo-Orlando is the seventh largest. United can now only serve these markets with significant backtracking. Azul would also potentially give United access to more secondary cities via Campinas. Currently Azul interlines with United at Sao Paulo Guarulhos and Rio de Janeiro Galeao, where Azul offers fewer destinations than Campinas. Azul also has the potential option of working with JetBlue. Mr Neeleman told Bloomberg that Azul is currently in talks with JetBlue over a codeshare partnership which would begin when Azul enters the US market in 2015. Ideally Azul will find a way to work with both United and JetBlue. Both are natural partners, with United keen to find a replacement for TAM, which left Star when it joined oneworld in Mar-2014. Avianca Brazil is now in the process of joining Star but is a smaller carrier with a much smaller network (about 25 destinations compared to just over 100 for Azul). JetBlue codeshares with several foreign carriers and is generally open to partnerships. While JetBlue and Azul are naturally linked through Mr Neeleman and common business models, there has never been a need to pursue a partnership as JetBlue only serves the northern part of Latin America while Azul has so far stuck to domestic operations. With Azul now preparing to enter the US market, the Azul-JetBlue dynamic obviously changes considerably. Indeed, it is unlikely that Mr Neeleman would have made the move to enter the US market without having first shared views with former colleague Dave Barger. JetBlue has also looked at acquiring A330s to enable expansion deeper into South America. With Azul making the first move, JetBlue is likely to be intrigued and could learn from Azul as it becomes the first LCC in the Americas to operate long-haul flights. Few would have predicted Azul expanding into widebody aircraft and entering the US before JetBlue acquired widebodies and launched services to Brazil. But the market conditions and opportunities Azul faces in Brazil are much different from what JetBlue faces in the US. Azul has quickly expanded domestically to become Brazil’s third largest carrier, with a 17% share of domestic RPKs in 2013 and again a 17% share in the first two months of 2014, according to Brazil ANAC data. 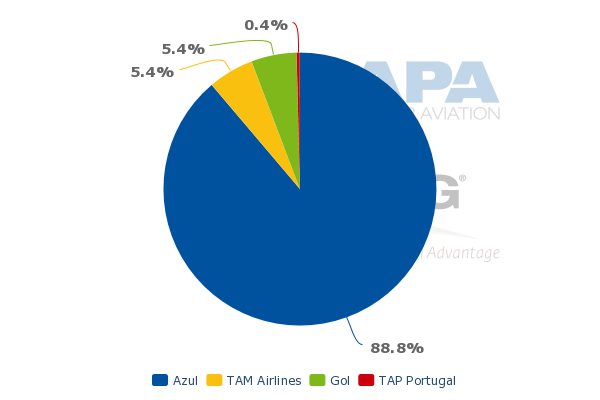 Azul is already almost half the size domestically of Gol and TAM, which accounted for 37% and 38% shares respectively of the domestic market in the first two months of 2014. Avianca Brazil, which only operates domestic services and could now be tempted to make a move on its long-held ambitions to expand into widebody aircraft, accounted for 8% of domestic RPKs in the first two months of 2014. However, Azul’s opportunities for further domestic expansion are limited. Azul needs the international market to continue its growth trajectory and given Brazil’s geography the options for international expansion are limited without widebody aircraft. The opening exists for a second Brazilian long-haul carrier and by pouncing now Azul is able to put its stake in before a competitor is able to make a move. But making the leap from a regional fleet to A330s necessarily contains risk, particularly as it comes before Azul has been able to complete an initial public offering. A key component in reducing the level of risk exposure will be the nature of Azul's partnerships. Existing independent long-haul low cost operations rely heavily on short-haul connectivity at their bases; Azul's domestic network alone is unlikely to be sufficient to deliver the necessary feed to support a long-haul operation. While the predominant traffic flow is from the US to Brazil, a potential JetBlue feed into Azul widebody services would go a long way to securing a profitable operation.